We moved into a new apartment where the living room, kitchen, and office are all upstairs. At first I was bummed but now I'm glad. It's mighty convenient to have the office an extension of the kitchen. I work, and then when I need a break I cook. I've been cooking a lot with tomatoes these days. Heirloom tomatoes are the best! Our house is coming together. We have an ocean view. Fancy! 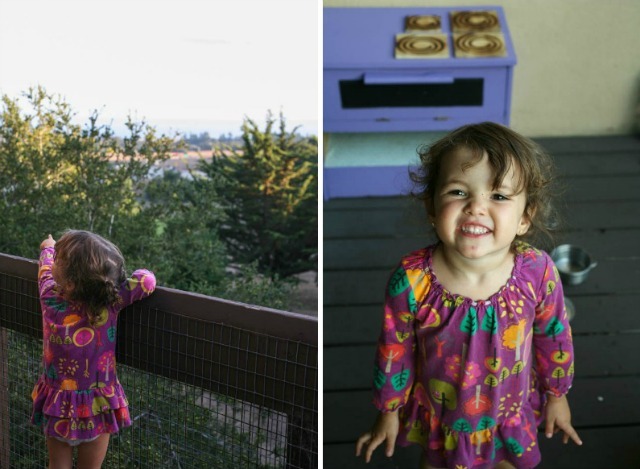 We like our porch area, it's perfect for a small garden and for Maria's birthday purple kitchen. I might have to do a separate post on this play kitchen but I was lame and didn't take a before picture. Basically before this purple kitchen existed in it's current form it was a total beaten up side table that was on the side of the road for grabs. Christian grabbed it, fixed it up, took Maria to Ace to pick a color, and now it's a cute little stove which she l-o-v-e-s.
And our hammock is up which is a sure sign that things are coming together. 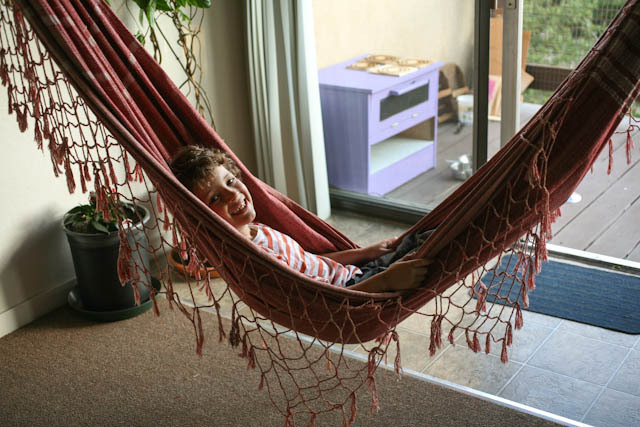 I remember putting Enzo in this exact same hammock when he was a tiny baby. What the heck?! 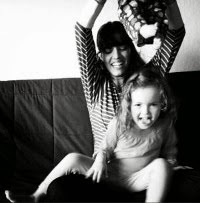 Stop growing! By the way I've been getting a lot of emails asking when new baby is due. It's due in November, 4th or 6th I can't remember which date exactly. My first two were late, this baby will probably be late as well. I've also been asked about cravings. Right now I'm still catching up on eating all the things I craved when I was in Brazil - like sweet corn and heirloom tomatoes. Lucky for me both are still plentiful. 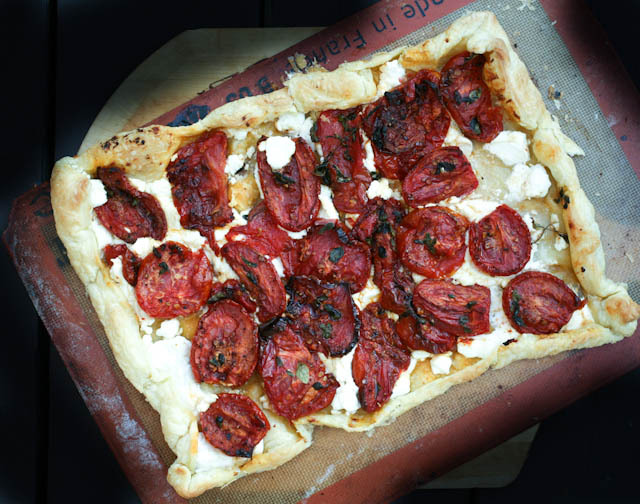 So are you ready for a roasted heirloom tomato tart recipe with goat cheese? This is what we had for dinner last week and we loved it! Oh boy, how many tomatoes will you need? I'm not 100% sure. Lets say 8-10, depending on the size of your tomatoes. 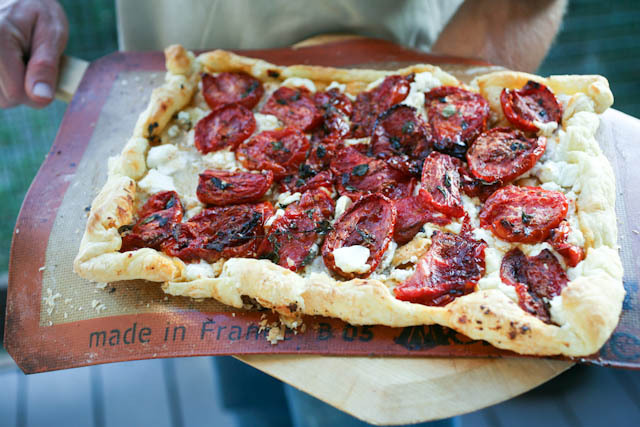 Basically if you have a whole cookie sheet full of tomatoes, like I do on top, then you're good to go. It will be enough for 1 tart. 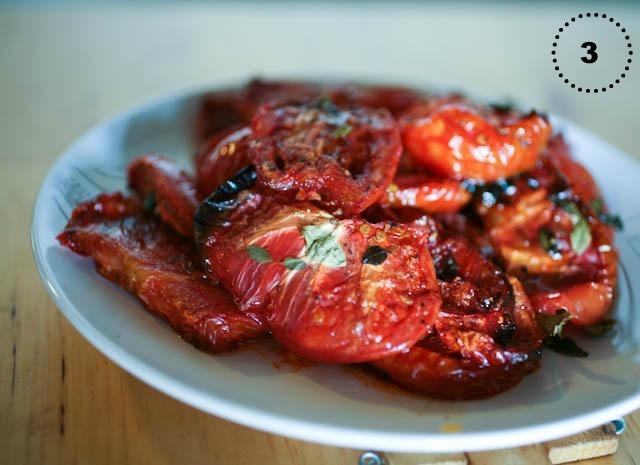 Rinse out your tomatoes, cut them up, and generously, I mean really generously, season them. Use salt, use pepper (lemon pepper is my fave), use fresh herbs like oregano and basil. Drizzle with olive oil. Then bake for 2 hours at 300*F.
During the last 30 minutes of roasting remove your puff pastry sheet from the freezer so it can thaw out. 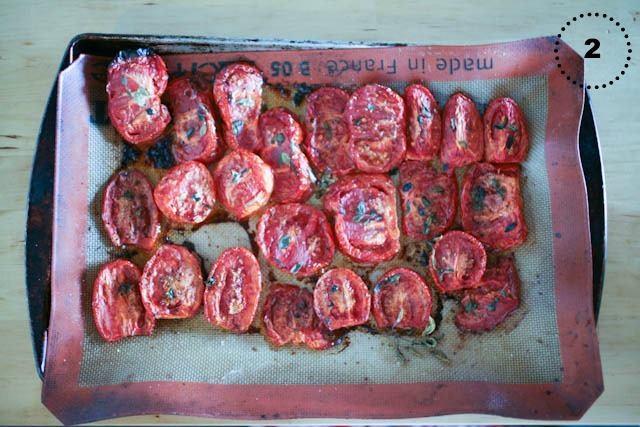 The tomatoes are done when the outside has shriveled up. The middle should still be soft and juicy. 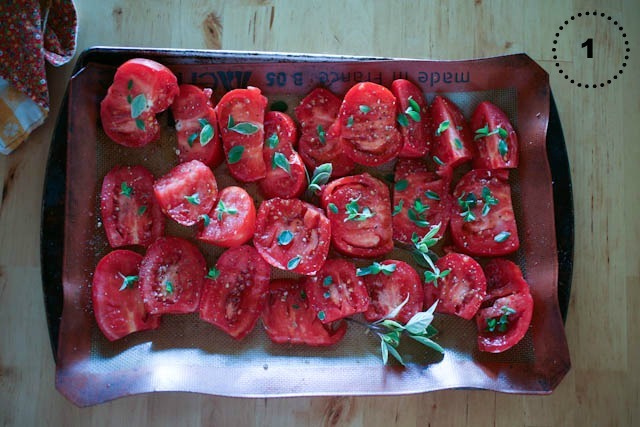 Remove the tomatoes from the cookie sheet. Leave the tomato juices on the pan. You're going to want your puff pastry to soak up all that good stuff. Roll out your puff pastry dough so it's thin and covers up the entire pan. 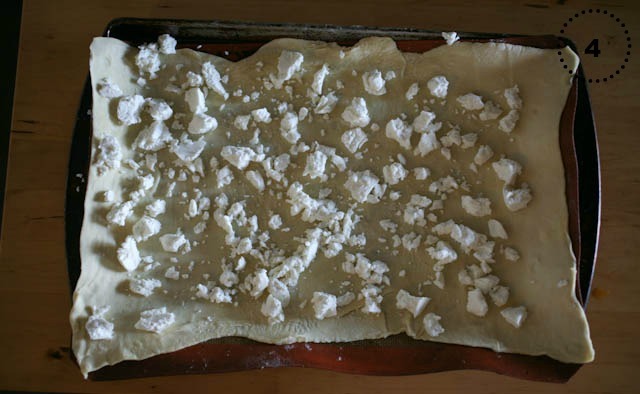 Crumble your goat cheese and spread it out on top of the puff pastry. If you love goat cheese sprinkle more. 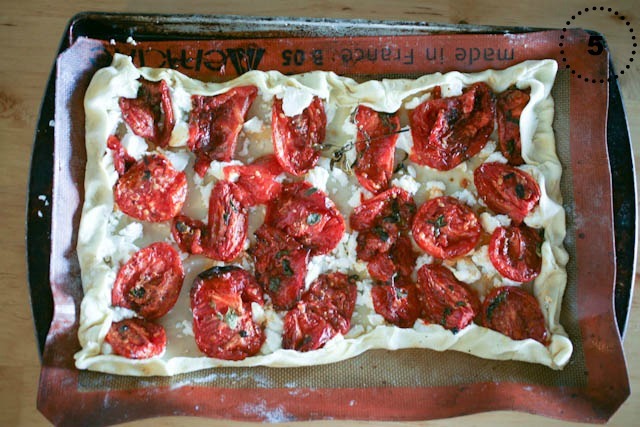 Add the roasted tomatoes on top. Bake for 15 min at 400*F.